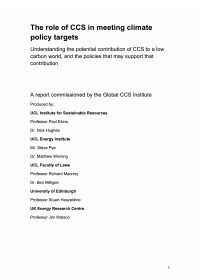 The finance sector appears ready to invest in the global deployment of CCS subject to three prerequisites, according to a new report funded by the Global CCS Institute and carried out by The Climate Group and Ecofin Research Foundation. The report, 'Carbon Capture and Storage: Mobilising Private Sector Finance,' provides insight into the views of private sector capital providers on financing first generation industrial scale CCS projects. It canvassed more than 30 private sector capital providers to understand their view on the risks and returns of a hypothetical post-combustion new build, coal-fired power station.